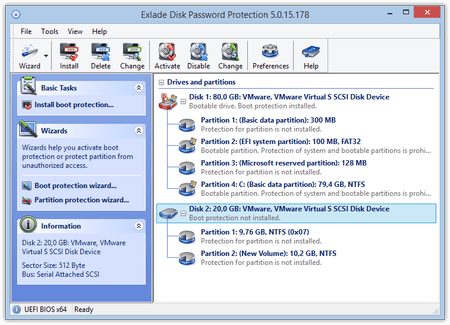 A utility providing comprehensive professional protection of the operating system load and hard disk contents against unauthorized access by setting a unique password. Restricting access to a specific disk, partition, and removable drive (USB drive, flash drive, memory card, etc.) hides it from the system device list. Not only is the password used to access the contents of a disk, but it is also required to identify it. The utility also allows you to set a unique password to protect any operating system load from any disk. Your passwords are securely encrypted and stored in the read-protected segments of the disk. Because the Disk Password Protection 5.5.1 system provides data access restriction at the low, hardware level, the protection mechanisms start working with the disk directly even before the operating system and any third party software are launched. This protection logic and the innovative technology of accessing disk partitions provide stronger protection and help avoid the potential interference of unauthorized software in the protection algorithms of the utility. Disk Password Protection 5.5.1 is perfectly optimized to work with Windows 8 or higher and can be used to control load protection in BIOS and with UEFI. In addition to MBR disks support, the utility has the feature of protection of the disk and partition load on GPT devices. Support for both basic and dynamic disks is also included. Another important advantage is that uninstalling the utility will not automatically remove the protection. Even after the OS is deleted, all of the protected partitions and disks will remain protected until you disable the password protection, and that is impossible to do in any other way other than with the Disk Password Protection 5.5.1 utility tools and respective passwords. Changes: The ability to change the welcome message that is displayed when you are asked to enter the password before booting the system was added to the boot protection module. Automatic analysis of password reliability when installing the boot protection and activating section protection was added. When you update or reinstall a program, you can now choose a different path to the folder where the program will be installed. Error processing for writing to disk sectors when enabling/disabling the boot protection was improved. An unregistered, evaluation version of Disk Password Protection may be freely distributed, provided the distribution package is not modified. No person nor company may charge a fee for the distribution of Disk Password Protection without written permission from the copyright holder EXLADE, Inc. THE LICENSE AGREEMENT FOR USE AND DISTRIBUTION The present license agreement (hereinafter "Agreement") is a legal agreement between you (the natural or legal person) and EXLADE, Inc. with regard to the software Disk Password Protection (hereinafter "Program"), including the software which has been recorded on an information carrier and any "embedded" or electronic documentation.